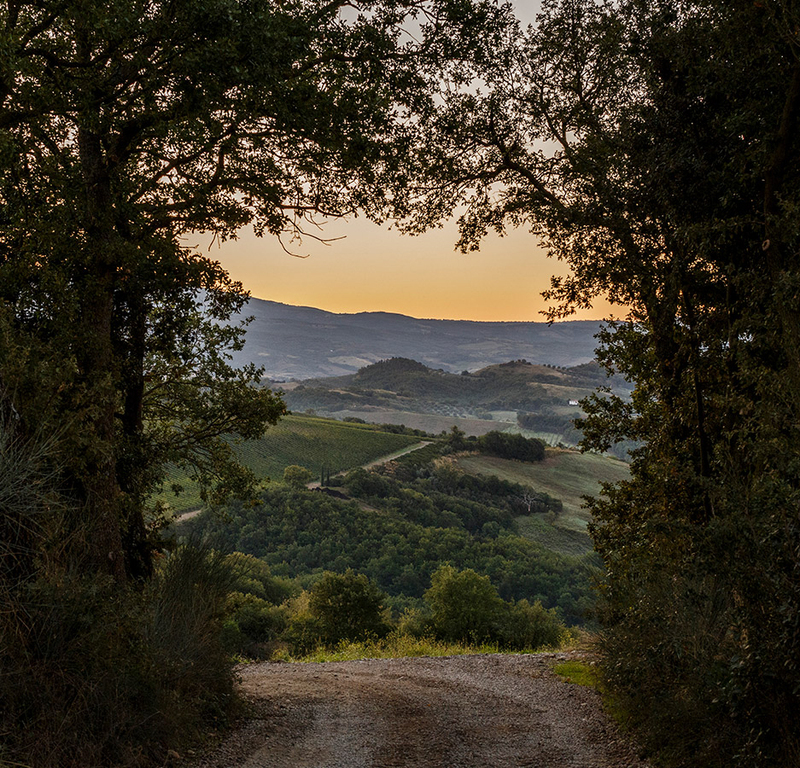 Wine had been made in Montecucco since the time of the Etruscans, a tradition now continued by Maria Iris Bertarelli and Claudio Tipa, who purchased the vineyard in 1998 to be the heart of the Domaine that it was their vision to create. ColleMassari produced its first vintage in 2000 and in 2014 the group was named Cellar of the Year by the prestigious and renowned Gambero Rosso guide. 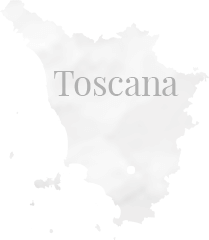 The Castello ColleMassari winery is located in Cinigiano in the foothills of Monte Amiata, about 1050ft (320m) above sea level. It is about 24 miles (39km) to the north-east of Grosseto in the DOC Montecucco, which is famous for its particularly favourable micro-climate. The Castello ColleMassari is not entirely a medieval castle or a feudal seat of power. Its structure is more reminiscent of a fortified hamlet or even a grancia, a type of protected agricultural operation, founded by Cistercian monks and the Santa Maria della Scala Hospital in Siena in the 8th century. 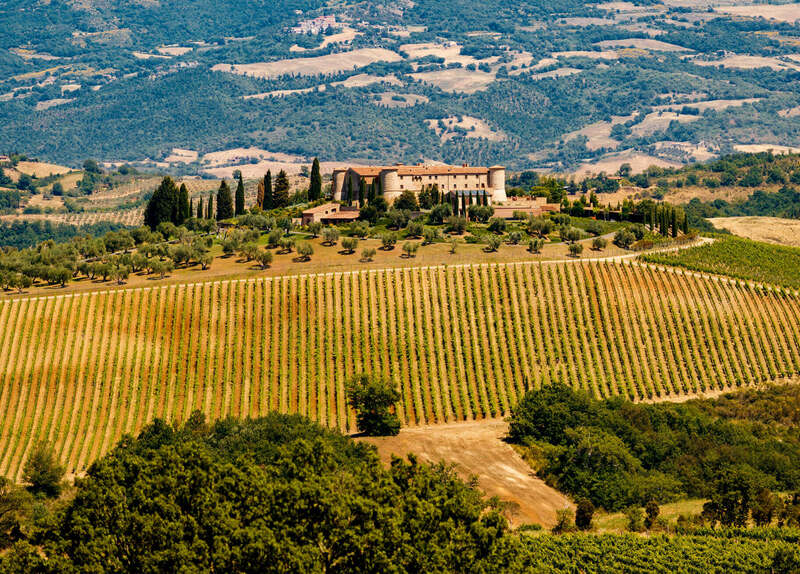 During this era, they set up an agricultural system between Siena and the Maremma that consisted of 22 grance, which helps to explain the name Massari. In the Middle Ages, the term massari or massaro referred to a representative of an agricultural organisation, an important part of which was the farmhouse was located in the centre (massa) of the area. Country* ItalyAfghanistanAland IslandsAlbaniaAlgeriaAmerican SamoaAndorraAngolaAnguillaAntarcticaAntigua and BarbudaArgentinaArmeniaArubaAustraliaAustriaAzerbaijanBahamasBahrainBangladeshBarbadosBelarusBelgiumBelizeBeninBermudaBhutanBoliviaBosnia and HerzegovinaBotswanaBouvet IslandBrazilBritish Virgin IslandsBruneiBulgariaBurkina FasoBurundiCambodiaCameroonCanadaCape VerdeCayman IslandsCentral African RepublicChadChileChinaChristmas IslandCocos (Keeling) IslandsColombiaComorosCongoCook IslandsCosta RicaCroatiaCyprusCzech RepublicDemocratic Republic of CongoDenmarkDisputed TerritoryDjiboutiDominicaDominican RepublicEast TimorEcuadorEgyptEl SalvadorEquatorial GuineaEritreaEstoniaEthiopiaFalkland IslandsFaroe IslandsFederated States of MicronesiaFijiFinlandFranceFrench GuyanaFrench PolynesiaFrench Southern TerritoriesGabonGambiaGeorgiaGermanyGhanaGibraltarGreeceGreenlandGrenadaGuadeloupeGuamGuatemalaGuineaGuinea-BissauGuyanaHaitiHeard Island and Mcdonald IslandsHondurasHong KongHungaryIcelandIndiaIndonesiaIraqIraq-Saudi Arabia Neutral ZoneIrelandIsraelJamaicaJapanJordanKazakhstanKenyaKiribatiKuwaitKyrgyzstanLaosLatviaLebanonLesothoLiberiaLibyaLiechtensteinLithuaniaLuxembourgMacauMacedoniaMadagascarMalawiMalaysiaMaldivesMaliMaltaMarshall IslandsMartiniqueMauritaniaMauritiusMayotteMexicoMoldovaMonacoMongoliaMontserratMoroccoMozambiqueMyanmarNamibiaNauruNepalNetherlandsNetherlands AntillesNew CaledoniaNew ZealandNicaraguaNigerNigeriaNiueNorfolk IslandNorth KoreaNorthern Mariana IslandsNorwayOmanPakistanPalauPalestinian Occupied TerritoriesPanamaPapua New GuineaParaguayPeruPhilippinesPitcairn IslandsPolandPortugalPuerto RicoQatarReunionRomaniaRussiaRwandaSaint Kitts and NevisSaint LuciaSaint Pierre and MiquelonSaint Vincent and the GrenadinesSamoaSan MarinoSao Tome and PrincipeSaudi ArabiaSenegalSerbia and MontenegroSeychellesSierra LeoneSingaporeSlovakiaSloveniaSolomon IslandsSomaliaSouth AfricaSouth Georgia and South Sandwich IslandsSouth KoreaSpainSpratly IslandsSri LankaSurinameSvalbard and Jan MayenSwazilandSwedenSwitzerlandSyriaTaiwanTajikistanTanzaniaThailandTogoTokelauTongaTrinidad and TobagoTunisiaTurkeyTurkmenistanTurks And Caicos IslandsTuvaluUgandaUkraineUnited Arab EmiratesUnited KingdomUnited Nations Neutral ZoneUnited StatesUnited States Minor Outlying IslandsUruguayUS Virgin IslandsUzbekistanVanuatuVatican CityVenezuelaVietnamWallis and FutunaWestern SaharaYemenZambiaZimbabwe This field is required. To visit the ColleMassari Wine Estates website, you must be of legal drinking age within your country of residence. If no such laws exist in your country you have to be over 21 to visit our site.